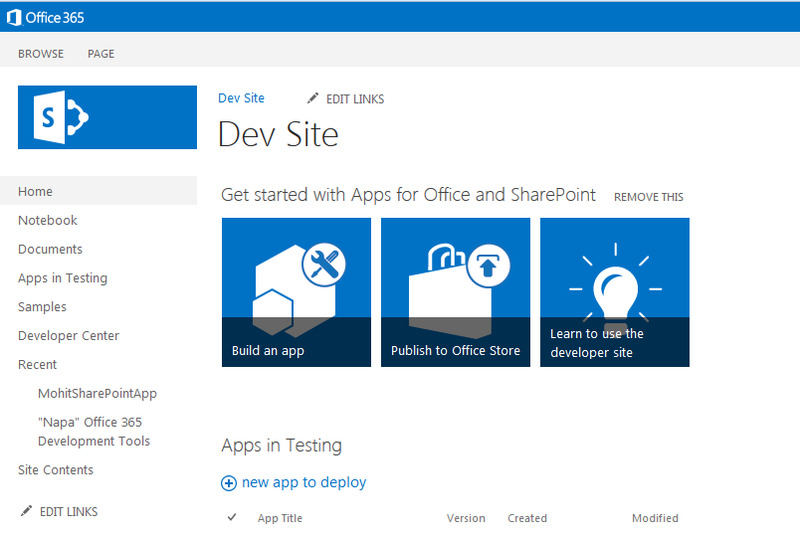 January 2014 – Share SharePoint Points ! Recently, got chance to look out of SharePoint server versions towards SharePoint Online with office 365. I should say our Microsoft developers brothers are thinking a lot to save our time. What else a developer want if he come to know that he just need to open a browser and develop code there like w3school. Wooaa… !! I just found a app called “NAPA” sounds similar to like “NASA” but really works like boon for app developers. While working on SP server, you might have noticed one site template “Developer Site”, Well I never noticed that it such a fool. 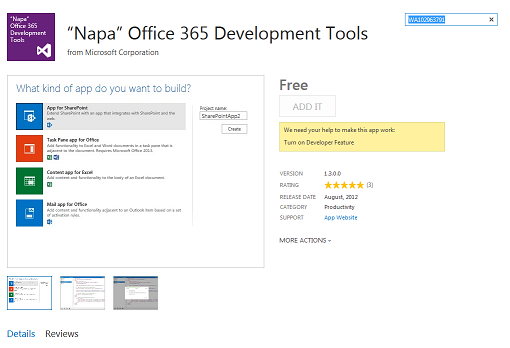 But this site allows you to create the online apps using the “NAPA” tool. In order to install “NAPA” first followed this blog but could not worked for me 😦 . Then I did google and found another way to make it work. Basically, we have to activate the “Developer Feature” which is a site collection level feature and does have option to activate it from UI. 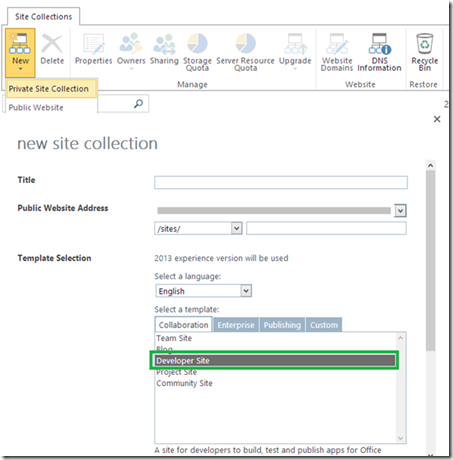 2) Create a Private Site Collection with “Developer Site” template. 3) Now open this fresh site and click on gear button(Site setting) on top left of page and then click on “Add an app” link. 4) This will open a page where page which ask you to select the app template. But here you can find another option “Sharepoint Store” on bottom of the left navigation. Click on this link. 5) Now this is time you have to find NAPA app from the store (check your pockets for wallets guys!!). Just kidding, this app is totally free of cost. Type “WA102963791” code in to “Find an app” text box. 6) Here you go. That is all you have to do to start work with “NAPA”. I will be back soon with little more customization in Sharepoint Online as i will got experience to play with this beautiful online tool.